We hear a lot these days about the need to mimic natural ecosystems, increase biodiversity, improve soil structure, maintain year-round water-use, increase ground cover and soil organic matter levels, stabilise soil pH, stimulate nutrient cycles and enhance microbial antagonism to combat root-borne pathogens. No wonder our heads are hurting! There is little practical advice on how to incorporate these highly desirable features into the day-today reality of farming, let alone make a profit. That was, until a handful of innovative Aussie farmers came up with the elegantly simple notion of 'pasture cropping'. Graingrowers can now have all of the above, and more. They can graze their paddocks and crop them too. The pastures and the crops will improve with each passing year. How? Darryl Cluff and Colin Seis from the Central West of NSW are two of Australia's leaders in pasture-cropping technology. The Cluff-Seis pasture-cropping technique involves the direct seeding of an annual crop into perennial native pasture. The remarkable success of the technique has hinged on the fact that the C3 winter cereals fit neatly into the growth cycle of C4 warm season native grasses, which are dormant during the cooler months. This breakthrough in thinking places Mr Cluff and Mr Seis among the world's leaders in regenerative agriculture. They utilise natural ecological services to replenish and reactivate the resource base. With all agricultural practices, the true bottom line is whether soil is being formed or lost. If it is being lost, farming will eventually become both ecologically and economically unsustainable. Fifth-generation farmers Darryl Guff ('Olive Lodge', Birriwa) and Col Seis ('Winona', Gulgong) have looked for solutions to the severe land degradation problems in the Birriwa-Gulgong area in Central West NSW for many years. Lateral thinking, teamwork and daring to be different have been essential ingredients for the development of their pasture-cropping technique. Traditional techniques, which involved the complete removal of all vegetation, resulted in vast tracts of bare ground both before and after the crops. These areas were recolonised by relatively unpalatable perennial grasses and naturalised annual weeds. Soil erosion on arable land became extensive, accompanied by soil structural problems and rapid nutrient decline. The use of subclover and superphosphate brought temporary relief, but the long-term trend in soil health continued to be down. The average annual rainfall in the Birriwa-Gulgong district is around 600 mm (24 inches), with a slight summer dominance, although it is unpredictable and highly variable within and between years. 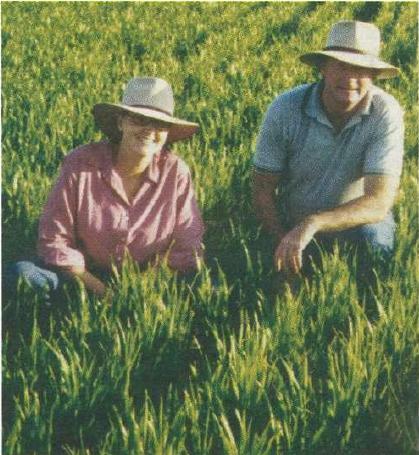 In 1995, following an 18-month drought, Mr Cluff direct-drilled an oat crop into a native redgrass (Bothriochloa) pasture in which subsoil moisture levels at sowing were zero, yet the crop performed well. The pasture-cropping technique was born. The technique is considered applicable across all rainfall zones. The following year, Mr Cluff began experimenting with wheat, and his Landcare colleague Col Seis tried pasture-cropping oats, some grown without herbicide application. Their crops were sown with an Australian-designed and constructed Agrowdrill direct-drill seeder, 30 cm row spacings, approx. 30-40 kg seed/ha and 85-135 kg/ha Granulock 15 fertiliser (N15:P12:S12), dropped into the ws with the seed. Mr Cluff intends to continuously crop some of his pasture paddocks to wheat to determine whether the microbial biomass and diversity associated with the living pasture base will be sufficient to prevent the proliferation of pathogens in the soil. In other paddocks, he's trying alternative crops such as lupins (which performed so well last year that follow-on summer pasture regrowth was inhibited), and experimenting with the re-sowing of native grasses such as Themeda australis (kangaroo grass) with the crop seed. Mr Seis has preferred to rotate the paddocks he pasture-crops each year, and reports significant improvement in the vigour and diversity of his native pastures. His principal focus is on livestock production and he uses pasture cropping as a pasture improvement technique. Mr Seis now pasture-crops 600 acres of his 2,000-acre (809 ha) property to oats, wheat and lupins. He has increased the cropped area every year without reducing his stocking rate; not only because the pasture health is continually improving, but also because the land doesn't have to be taken out of production and 'prepared' for cropping. His 2000 wheat, Whistler, yielded 3.63 t/ha. The year before, Janz didn't do as well and Mr Seis puts it down to choosing the wrong variety for the acid soils on his property. Oats have yielded up to 4.4 t/ha since 1995. Mr Seis says the property is producing around 39 kg greasy wool per hectare at an average cost of $2,047 per kg. This compares with a regional benchmark of 35 kg wool per hectare at $3.07 per kg. Livestock are important to the pasture-cropping method. Mr Seis has improved the gross margins on his sheep enterprise by using sheep to heavily graze pastures prior to sowing, as an alternative to spending money on pre-sowing herbicides or cultivation. He also now does not have to reestablish pastures, as used to be the practice in the past, because they are rapidly improving. Mr Cluff says they use conventional harvesting techniques for their cereals; with the grasses below the crop level, there's been no problem. They have not noticed any significant compaction. In fact, the root systems of the pastures seem to have a 'de-compacting' effect which both counteracts the compaction effects of machinery and stock, and also seems to de-compact previously compacted soil after it's been established for a couple of years. Mr Seis is experimenting with the re-sowing of native Paspalidium and Urochloa (previously Brachiaria) species along with crops. The tools are the Scorpion brush seed harvester and Germinator seeder, enabling locally occurring native grass seed to be harvested and re-sown. This innovative equipment (with more to come) was developed by Mr Cluff, Mr Seis and other members of the Barneys Reef Landcare Group, and skilfully transformed into engineering masterpieces in the hands of Doug Seis, Col's cousin. As with the pasture-cropping model itself, the fine-tuning of the machinery capable of harvesting and re-sowing the often difficult seeds of native grasses and legumes has required much creative effort and testing, devotion to teamwork, countless late nights and the occasional beer. The vision is to help develop a native grass seed industry which will enable regenerative practices such as the Cluff-Seis technique to be widely used. If native grasses are re-sown with crops, and nurtured via the pasture-cropping technique, millions of acres of farmed land currently suffering severe soil degradation and dryland salinity problems could be rehabilitated. Although the current pasture-cropping methodology has been developed for winter cereals, most annual crops would be healthier if sown into permanent, living, ground cover. Read this article in GC issue 35 - Subscribe and recieve the hard copy of GroundCover in your mailbox for free, remember to select 'Post' as your subscription method.